So folks, are we gonna do this? I think a summer deadline would be fair since this kit is still hitting the streets and some folks are limited on their painting schedules due to cold weather. With that said, let's do this! Anyone with suggestions, comments, etc....... please chime in at any time. I'm hoping to get one or two of these but being in the UK, we can't find out when they are to be delivered yet! Even the UK importer isn't saying (answering emails). Is it worth you scoring one off E-Bay? I'm in! If I don't get a red flake one, I'll be painting one red flake. Still waiting for mine to ship from Model Roundup. In the meantime, I might try to dig out that bare chassis I have left over from "back in the day" and see if I have all the parts to build a "nekkid" dune runner. IIRC that was a build option in the original MM kit so it should be "legal" for this CBP. Can't decide on a color for that, though. Don't wanna go with black. Don't want anything too flashy or high-tech like a flake, metallic, or pearl, as it would be representing a low-buck garage-built bomb. Maybe a simple red, yellow, or, orange? I'll have to see what paints I have laying around in good supply. Whatever you do Snake, don't do it in Revving Red! I call dibs and already bought the paint! LOL. I'm gonna "replicate" the 1:1 I bought when I was 14 ( I basically remember the color and the seats and top). I had mentioned mutang tail lights on my 2nd car but today as I was browsing a buggy forum and spotted one someone put Corvette ZR1 tails on ( frenched and round). I may be rethinking the Mustang lights. In the meantime, I might try to dig out that bare chassis I have left over from "back in the day" and see if I have all the parts to build a "nekkid" dune runner. IIRC that was a build option in the original MM kit so it should be "legal" for this CBP. Can't decide on a color for that, though. Don't wanna go with black. Don't want anything too flashy or high-tech like a flake, metallic, or pearl, as it would be representing a low-buck garage-built bomb. Maybe a simple red, yellow, or, orange? I'll have to see what paints I have laying around in good supply. Well it took some digging in the Snakepit but I found that "project." I could have sworn I had all new in-the-white parts (and I might still, somewhere) but what I found was painted flat black and gold, ick. Found the floorplan, spine, most if not all of the engine and transaxle, the rear suspension/shock thingies, the basic front suspension piece, the two roll bars, the bucket seats, and the steering wheel (and A steering colum but I'm not sure it's the right one). Am missing the steering box, front suspension tie rod dealie, hand brake, shifter, and pedals that I know of. 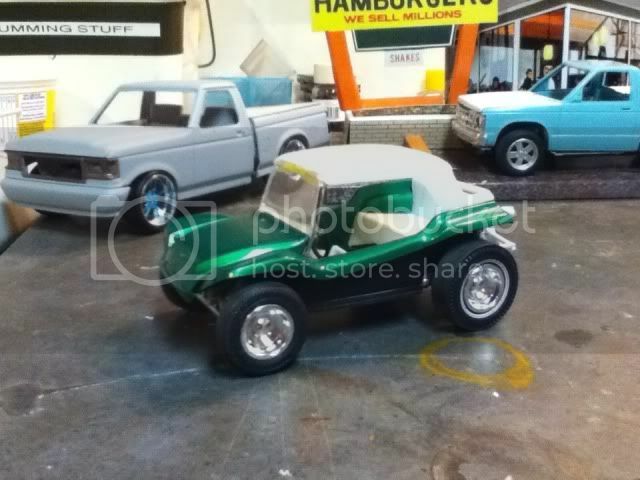 Looks like I'll have to make the tierod thing out of styrene rod, maybe fabricate a "custom steering box cover," and come up with pedals and levers, but it looks like a do-able project with a little work. Leaning toward yellow for the paint. Found several bottles of Model Master Bright Yellow and about all I ever use that for is model airplane propeller tips. But I also found a can of Testor Icy Blue flake, a color that turned out to be quite a bit different from what I thought it was when I bought it--I consider it kinda "girly" looking and will NEVER use it on a "good" model car--so I might go with that just so I didn't throw that money away. We'll see what I feel like when paint time comes. Not blue AND yellow...it's not a cub scout dune buggy...EITHER blue OR yellow. And no small-block, either. Found VW parts, looking garage-built. LOL.... you must not have picked up on my sarcasm............ you'll get to know me. Sarcasm? Now you're beginning to sound like me! LOL! LOL. 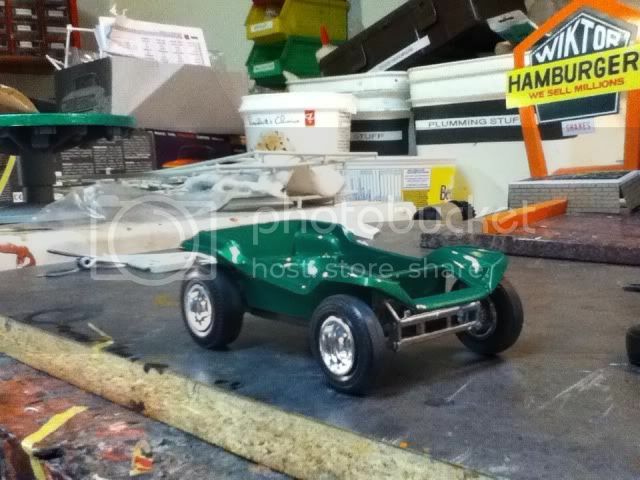 A rear mounted v8 tube buggy WOULD be cool, but maybe a bit beyond my scratchbuilding capabilities. 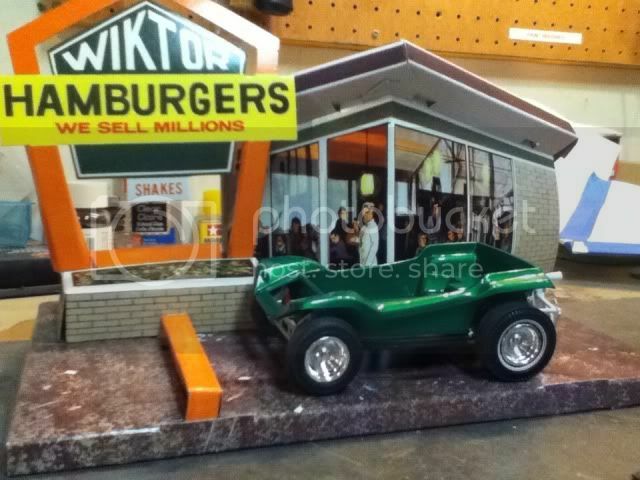 I knew some guys in PA that built a couple 1:1 on Blazer chassis' using old tube vw buggy bodies. Those things were SWEET! My Modelroundup kits arrived today, WOOT! Unfortunately, both are white. Oh well that's why Testors makes red metalflake paint, right? Meanwhile, here's the parts I have to play with to make my "nekkid" dune buggy. Most of the important stuff is here, but I'm missing the steering column, steering box, and front end tie rods. Can use the new Manx kit parts for patterns for these and scratch them up, I suppose. The next order of bidness will be to try to remove the hideous black and gold paint--what WAS I thinking when i painted it that way? 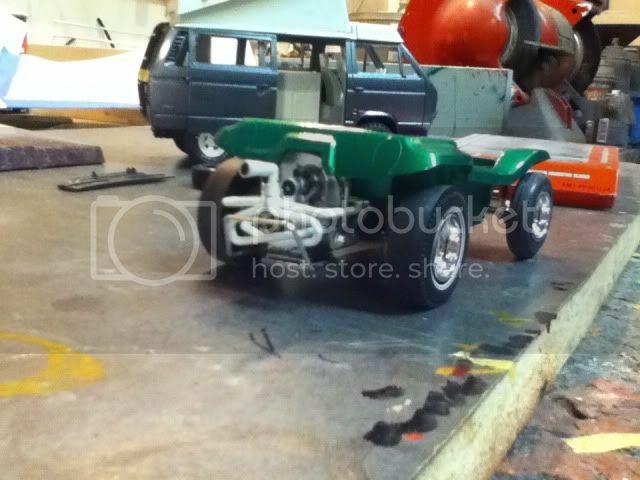 One club member had the new Meyers Manx built up and on display at our meeting this past Friday night and it featured a Turbocharged Corvair engine, steerable front wheels, and green paint. 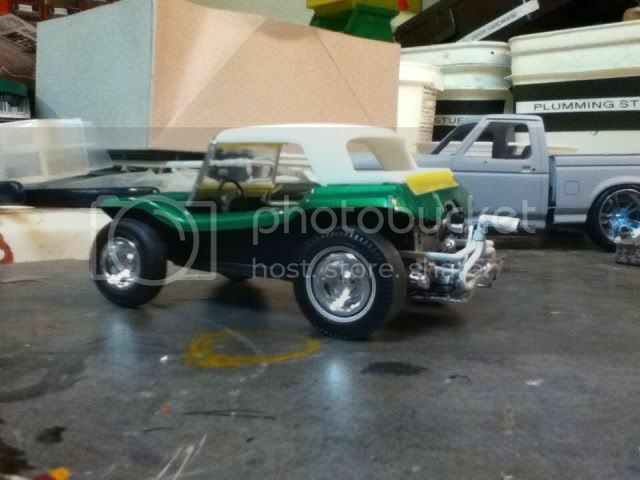 That was a very nice build he did Nick, I just wish the Corvair motor was included in the new Manx kits. 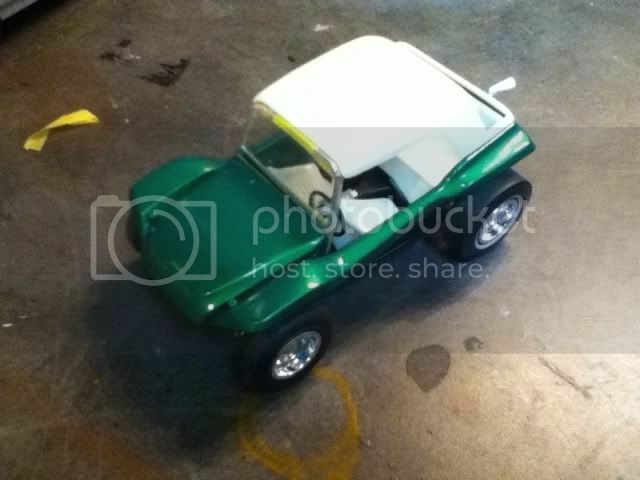 My California Buggy from a decade back had it, I wish now I had kept the pieces when it broke but I was so mad I threw it in the trash. Spenc, at least you still got a good foundation to work with there. Since you're going for the "on a budget, garage built" look, why don't you give it a quick spray of something, and then "chip" away the paint to give it the run through the woods flavor? Looked on ebay as still no idea when they are to be sold here. All are only offered to US customers especially when they don't allow or allow only 5 day returns so if the kit gets smashed in the post, nothing. I have a question. I know it's a different kit originally, but would the teevee buggy qualify? It does share the same chassis as the Meyers Manx. If not, that's cool. Just curious. I'm certainly not in charge of anything (although I believe I was the one who suggested this CBP), but I'd vote to allow it. As you say, same basic kit, just different body. In fact, the "nekkid" VW chassis I'm trying to rebuild/restore for this CBP originally came from a TeeVee if I'm not mistaken. Speaking of the TeeVee, I wonder if the molds for that body (and the shortened VW beetle) still exist, and if so, if they'll be reissued too. It looks like the Manx has been a HUGE sales hit, which I'd think would be encouraging. I can't think of any reason why ANY buggy shouldn't be allowed. Like you guys said,perhaps we can spark enough interests for some other re-issues. I was just looking at the empty box for my Revell California Buggy last night (again basically the same kit, SLIGHTLY different body than Manx) and wishing they had released the Manx with a Corvair motor. I say build 'em if you got 'em! Heck, I wouldn't even mind seeing a Beetle with the Baja treatment. I also owned one of these in 1:1 and miss it. 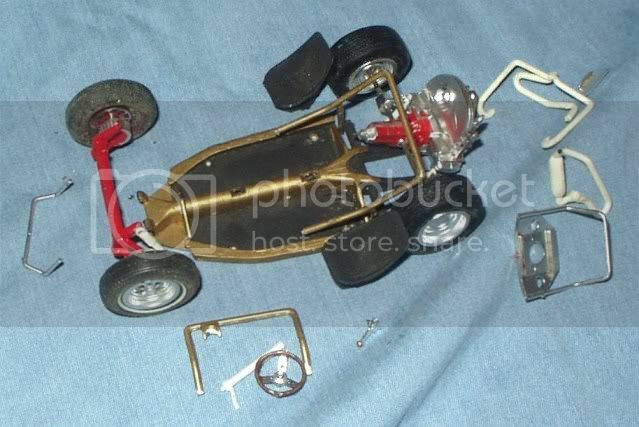 hey guys so I decided to build one of my meyers Manx kits. I started this build today and I have made quite a bit of progress. Nice work, bowtie. Btw, what colr name and brand of green is that? Looks killer. One day?! I'm calling BS on that one......LOL. Looks good man, I like that green. I thought about starting one of mine today and went with a 66 Galaxie instead. The stinger and headers look really good! Hey thanks guys. And nope, it's true, I got all that done in one day lol. I hope to have it done or close to done today. It's been a wonderful build so far, a few fit issues, but no big deal. I bought 2 already and I might buy 2 more because they are so fun to build. The green is testors one coat lacquer mystic emerald. It is actually a bit lighter then in the pics. As I still don't know when we will get any new Manx kits into the UK can I submit my Empi Imp that I rebuilt from a glue bomb late last year? I used that green on several builds, love it! Those buggies were MADE for metallic paints. Patrick, hang in there buddy, the build isn't ending anytime soon. I just need to get some paint to do the top and the seats. Then the final details and it's done. Here's some of my progress shots of my Manx build. I striped the chrome from most all of the engine pieces to get a more accurate finish to the engine. I also pulled a different set of tires out of my parts box for this build. I'm surprised there isn't more interest in this build . Well , here is the start of mine . After I took the pictures I realized I used too large a wire for the plug wires . Oh well , better get new glasses ! I made a fan guard out of the screen from a splatter shield for cooking .